Our lead product candidate, entinostat, is a selective, oral, once-weekly, class I HDAC inhibitor in development in combination with exemestane for advanced hormone receptor positive breast cancer and in combination several approved PD-1/PD-L1 antagonists as a potential treatment for multiple solid tumors. Endocrine based therapy is a backbone of treatment with proven clinical benefits for women HR+, HER2- breast cancer. Overtime, disruption of estrogen mediated signaling within the breast cancer cell results in acquired resistance to hormone therapy. Entinostat is thought to re-sensitize these cells to endocrine therapy. In a phase 2 randomized, placebo-controlled study, ENCORE 301, entinostat demonstrated a significant (8 mo) improvement in overall survival in combination with exemestane vs exemestane alone. 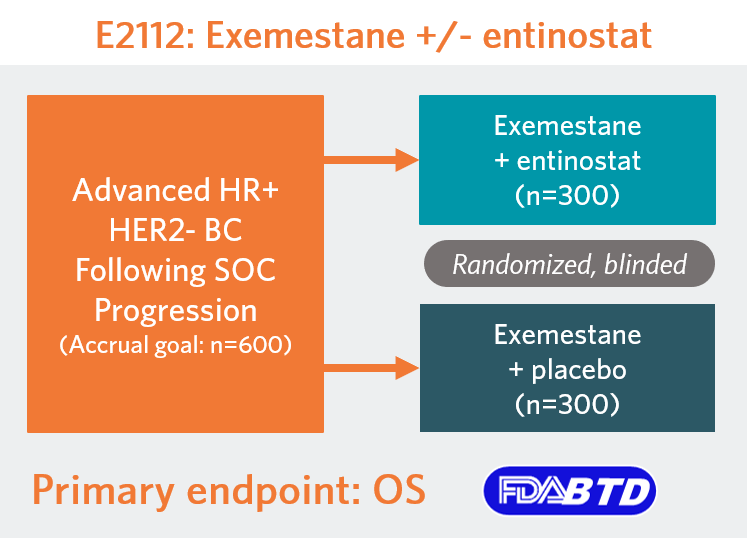 This result led to Breakthrough Therapy status from the FDA, and the initiation of E2112, a phase 3 registration enabling study designed to evaluate entinostat in combination with exemestane in HR+, HER2- metastatic. Enrollment in E2112 was recently closed after a total of 608 patients accrued to the trial, and results of the overall survival analysis are anticipated sometime in 2019. Class 1 HDACs have been shown to influence the anti-tumor immune response through down-regulation of immune suppressive cell number and function, increased antigen presentation on cancer cells and enhanced cytotoxic T cell activity. In preclinical studies, entinostat demonstrated synergistic anti-tumor activity in combination with immune checkpoint inhibitors in multiple tumor models including lung, breast, colon, kidney and pancreatic cancers, suggesting a potential to further increase the ability of the patient’s T cells to attack the tumor. To translate these preclinical findings to a clinical setting, Syndax set up a number of collaborations testing entinostat in combination with approved PD-1/PD-L1 antagonists with a goal of targeting resistance to immune checkpoint therapy across a range of immune phenotypes. Both “hot” or inflamed and “cold” or non-inflamed tumor types were chosen as well as settings in which immune checkpoints had been administered with limited clinical benefit. 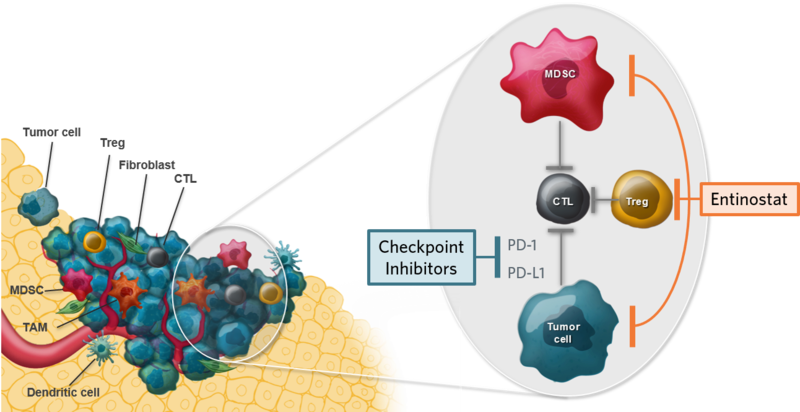 Through the ENCORE I/O program, our results indicate that entinostat combined with immune checkpoint therapies may be most effective in “inflamed” tumors such as NSCLC and melanoma where immune checkpoint therapies have been previously tried but the disease nonetheless progressed. Our phase 2 data from ENCORE 601 (testing entinostat in combination with pembrolizumab) in patients with NSCLC whose disease has progressed following treatment with an anti-PD-(L)1 and chemotherapy also indicate that patients with higher levels of a circulating cell called a classical monocyte may have better outcomes than those with lower levels.